Not only can a well-built outdoor deck add value to your home, it can add value to your lifestyle as a comfortable place to entertain family and friends. An outdoor deck serves as a focal point for entertaining in your backyard. 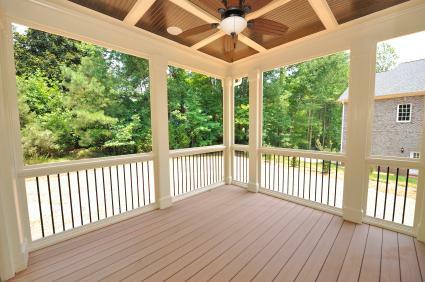 The deck is an extension of your home, similar to adding an extra room. There are many extra features that can be added to a deck that can enhance and complement your lifestyle and your home. A carefully thought-out, well designed and well-built deck will be an aesthetically pleasing, functional feature for your home and property. When planning the design for your outdoor deck, consider several options. Decide how you plan to use your outdoor deck. Will it be used primarily for outdoor cooking and dining? Or do you plan to include a hot tub or swimming pool? 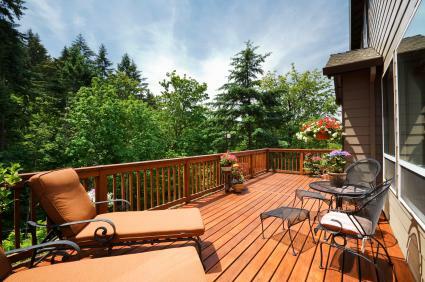 Do you want to enclose the deck for privacy or protection from insects or leave it open for sunbathing and stargazing? Next, decide how big the deck should be. Consider how many people at a time will be using it and what will be stored on it, such as patio furniture, barbecue grills, etc. The size will also be determined by how much available space you have in your backyard and the size of your home. The location of your deck will depend largely on the design of your home and the layout of your yard. You may only have one or two locations that would be practical. You might have the option of incorporating multiple levels to your deck's design, with one portion enclosed for privacy and another portion open for sunning or enjoying the view. Low deck plans - One to four foot elevations designed for ground-level walkout homes. Mid-elevation deck plans - Four to eight foot elevations designed for lookout and split-level homes. High deck plans - Eight to twelve foot elevations designed for second-story homes. Multi-level deck plans - Varying elevations usually works best for split-level or second-story homes. Porch, pergola and gazebo plans - Porches of varying sizes with built-in roofs, pergolas and attached gazebos. The extra features you decide to add to your deck will depend on what you want to use it for, how much available space you have and your budget. An outdoor deck must be able to withstand decades of exposure to harsh weather elements including rain, hail, snow, wind and intense heat from the sun. Traditionally, most decks were made entirely of wood such as Western Red Cedar, Redwood or pressure treated pine. Treated pine is still the best option for the undercarriage framing including joists, beams and posts, due to its excellent strength and affordability. For the remaining deck material, composites are the preferred building material. Composites are a synthetic material, usually made from 50% plastic and 50% wood fiber. Composites have the look and feel of real wood, but are much easier to maintain. The plastic helps protect the wood from moisture and insect damage. Another new option for the floor of your deck is called the Silica system. This system allows you to add a structural underlayment that connects to the wood joists, enabling you to add stone, brick pavers, slate or travertine tile to your deck flooring. With so many options to consider, designing and building an outdoor deck can be a complicated process. It is best to start by simply browsing through books, magazines and online, looking at all the different designs of finished outdoor decks for ideas and inspiration. Next, figure out a budget. Once you know your budget and have a basic idea of the type of deck you want to build, think about purchasing a plan or contacting a contractor.